ChemoMonday proved to be quite an interesting day. I had been suffering from “the crud” and still had a hacky cough and runny nose. So, when I went to SCCA, I put on a mask so as not to infect other immuno-compromised individuals like myself. 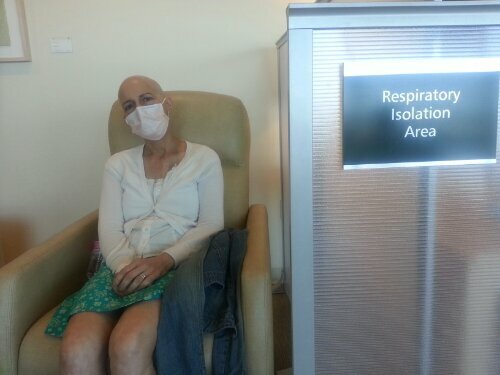 Still wearing my mask, I arrived at the check in counter where the chemo check in person looked at me and asked if I was on “The List?” I told her I didn’t know what list she was talking about. She said since I was wearing a mask I needed to be cleared off “The List.” I told her I didn’t know what she was talking about but that I didn’t have a sore throat or fever. I asked if my chemo nurse had this special power to clear me and she told me maybe I should go talk to my oncology nurse. 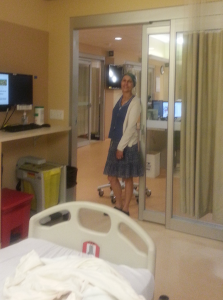 So off to the 3rd floor we went (my sister Claire was my chemo buddy du jour) where I paged my oncology nurse. She came out to the waiting room and I explained I needed to be cleared to get off “The List” that I wasn’t sure I was even on. I asked her if she could clear me. She looked at me and said “Me? I don’t even know what you are talking about. 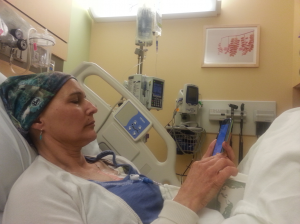 I need to talk to the doctor.” Off she went to find the oncologist. A bit later she came back and said you are on “The List” and will stay on “The List” until you have three days of no coughing or running nose. Sigh…..Back to the 5th floor to the same check in person to tell her I am now on “The List.” It takes about a nanosecond to get on “The List” so I asked how long does it take to get off “The List” All four of the people working at check in drop their heads and shake them slowly, “It can take a month” one of them replied. A month! 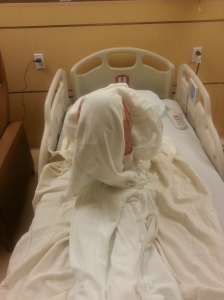 I am told I need to sit in Respiratory Isolation. Sigh….. So Claire and I sit in the “special” seats so I can hack and cough and blow my nose without infecting anyone. 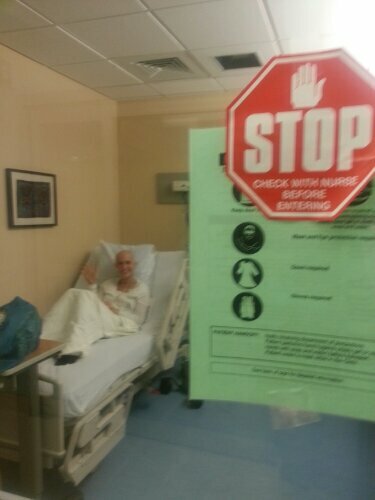 When it is my turn for chemo, I am assigned to room 22. It is one with sliding glass doors. As soon as the doors are closed a big STOP sign is slapped on the front along with a green sheet of instructions on entering my room. These are essential precautions so the nurses don’t spread my germs to other patients. While I understand and appreciate these procedures, it does make one feel ever so slightly like a pariah. 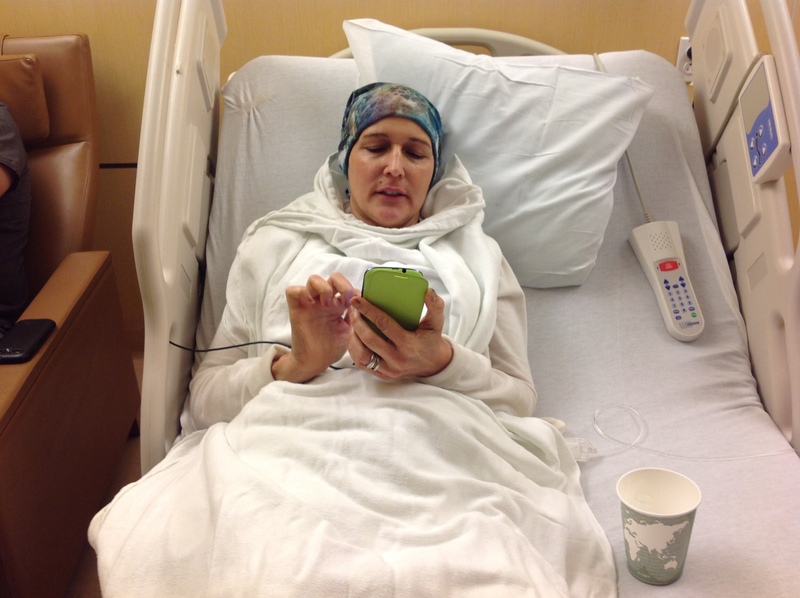 This entry was posted in Treatment Updates on July 11, 2013 by Loretta Stanton. One of the rarer side effects of Taxol is “nails changing color or becoming brittle.” The oncology nurse told me that you could loose your nails with Taxol but not to worry about it unless they ooze. Well…..my poor baby toenails are not what they use to be. They have become the victims of Taxol. They have oozed. I chewed ice during the A/C treatments to stave off mouth sores. I got mouth sores anyway but maybe they would have been worse without the ice. I have mouth sores now and am once again chewing ice during chemo. 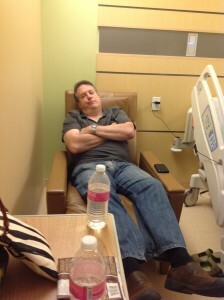 To help alleviate the nail issues, the chemo nurse decided I should try icing my feet while having chemo. The same principle applies to the toes as chewing ice does to the mouth. 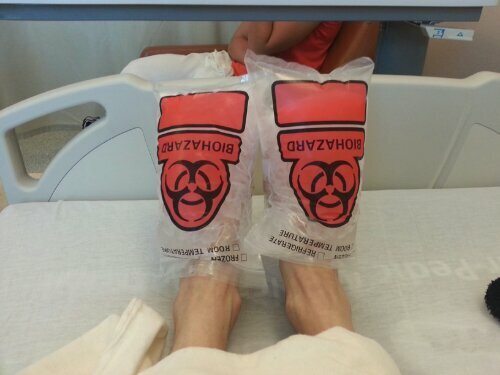 It just so happens that biohazard bags are the perfect foot icing device. There is a zip lock compartment that holds the ice and an outer pocket that is perfect for your toes. 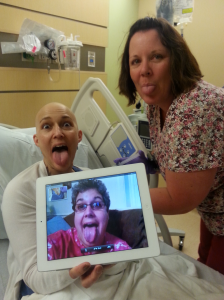 So with ice on my toes and ice in my mouth and heated blankets on my body, I spent my infusion time cold and warm. As with my mouth, I am not sure how much it helps but am worried that if I don’t ice, things could be worse. This entry was posted in Treatment Updates on July 3, 2013 by Loretta Stanton.